The town we live in had it's yearly Spring Fesitval last weekend. There are vendor booths, food, rides, etc - it's a fun event put on by the town. The town shuts main street down each year for one day for the festival. All of the shops in this downtown strip have been converted into an Antique and art district. While walking down the street, I spotted a cart full of robot arms in front of one of the antique shops! Quite an assortment - two with some type of wire drive system, one run with chains and sprockets and one big industrial looking arm with montster servos. I went into the shop to ask the owner about the bots - he wanted $350 for the entire cart and this was a firm price. I told him I'd be back later, then went to shoot a few pictures of the robots so I could figure out if they were worth anything. While shooting, the owner's son walked up - he was the one really selling the robots. He acquired them from his university. A few phone calls and visits later and I got the entire cart of robots, power supplies and controllers for $275. 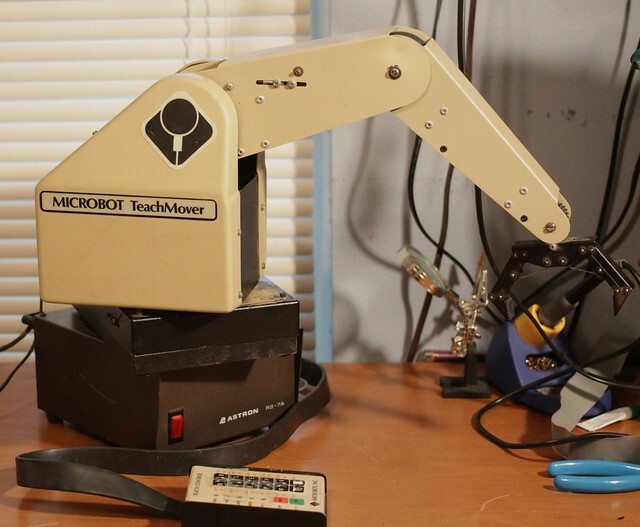 The Teachmover is an interesting robot from the early 80's. 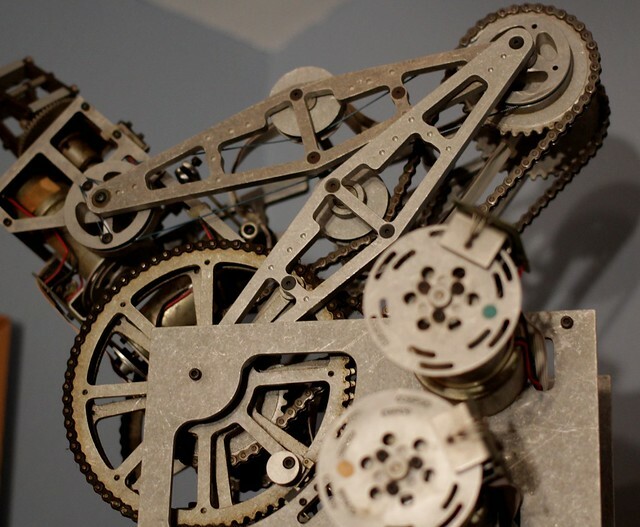 All of the servos are located in the base of the robot, with cables and pullys extending through the arm to operate all the joints. The idea here is that servos don't have to lift other servos, keeping the weight of the arm down. See the video below to really get a feel for how the Teachmover operates. 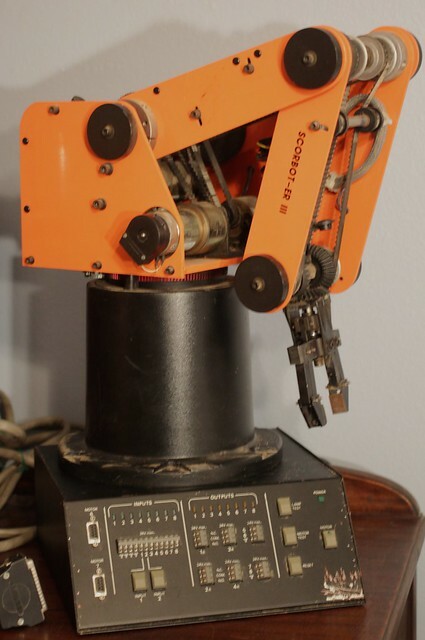 This robot arm was in pretyy good shape - I did have to take the base off and reconnect the control cable, which had no strain relief. I also had to de-solder and repair two of the buttons on the control pad. Functionally, the power supply stepper motors and cables were all good to go. 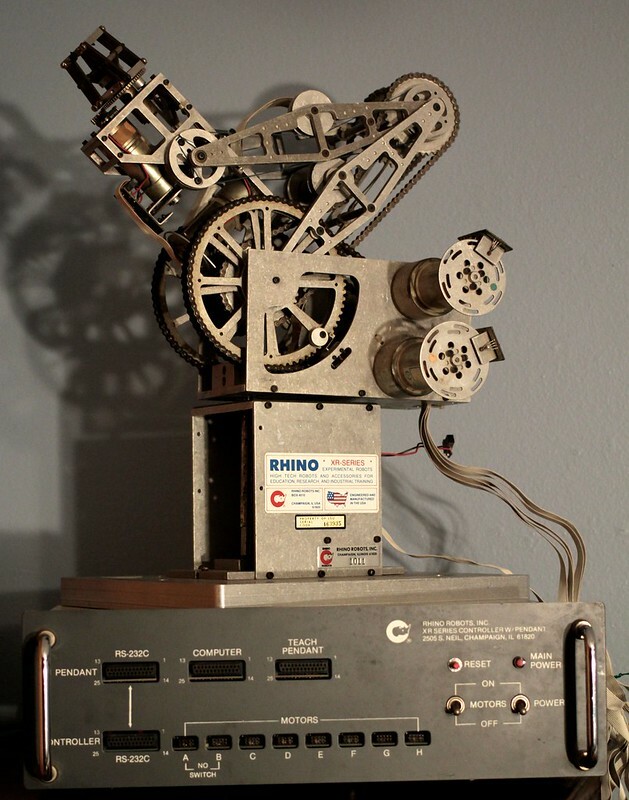 After experimenting with this robot for a bit, I listed it on eBay - I hope to make $200-$300, but you never know. I have another Teachmover robot that came with the lot. All of the internal circuitry was ripped from the bottom, so there are no control boards. A lot of the cables are but for some reason also. The only thing that is good on it is the Astron power supply. I'll try to sell it for parts, but I have my doubts whether anyone will want it. The Scorbot ER-III was the reason I was willing to buy this lot of surplus robots. Searching on eBay prior to purchasing the robot arms, I found where untested arms without controllers were going for as much as $650. So I plugged the power supply in, connected the robot arm and power it up. Everything seemed to power up fine. I ran the robot through the motor test and all servos responded. This is a very robust robot arm - the servos are very powerful and construction of the arm is heavy duty. I lucked out on this one - it's listed on eBay now, hoping to fetch $600-$1000 for it. The Scorbot ER-III did not come with a teach pendant and I was unable to find any software to control the robot, so the motor test is the best thing I can gauge it's operation by. A shame, it looks like it would be the most fun of the robots arms to play around with before re-selling. Rhino Robotics XR Series Robot and Controller. This Rhino Robotics robot looks awesome, heavy duty chains and servo motors. The chain which rotates the entire platform was missing. The power supply was also DOA. After opening the supply up, I discovered arcing around the power cable where it had been frayed. I cut around this bad section and a blown fuse and the power supply came to life. I connected the motors to the controller, and could tell they were getting power because they were resisting being turned manually. Unfortunately, the teach pendant failed to function and there appeared to be too much work involved to get this arm up and running. I will try to sell the arm for parts if possible. If all else fails, I will repurpose the cool 19 inch power supply rack. I'm selling these robots now, I'll post an edit to this post shortly to let you guys know how I fared on flipping these vintage bots! Heck, I'm kinda interested in the busted teachmover and/or the broken rhino! If you still have them, contact me via my email!